Welcome to Garrett Crispell Photography. 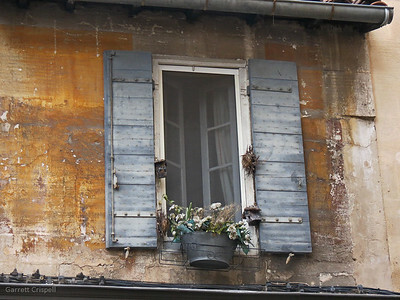 The site is available for your viewing pleasure and possible acquisition of your favorite images. Thank you very much for your time and feedback. During a business trip to Ketchikan, Alaska, I came across this older totem. 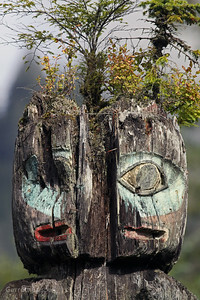 Ketchikan is the oldest city in Alaska, and is known for totems around the area. This totem was full of history and seemed to have a presence of its own. The logistics and effort to establish the operation of Kennecott Copper Mine is truly impressive. Throughout its operation, employees worked 364 days a year, July 4th was the only day off for the year... If you ever get a chance to check it out, it is worth the effort! 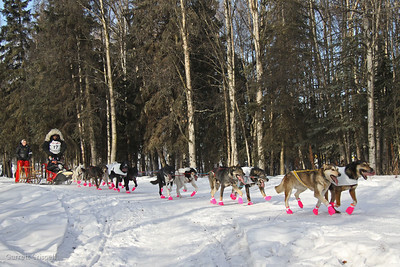 Ceremonial start to the Iditarod Dog Race occurs the day before the official start to the 1000 plus mile race. 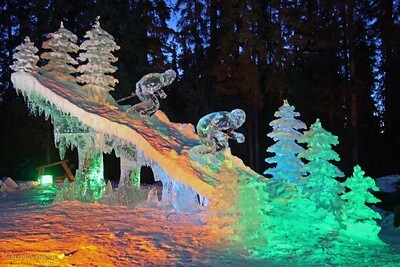 The festive air is enjoyed by thousands, people pay (serious money) to ride in the sled of mushers as the contestants mush through the Anchorage area. 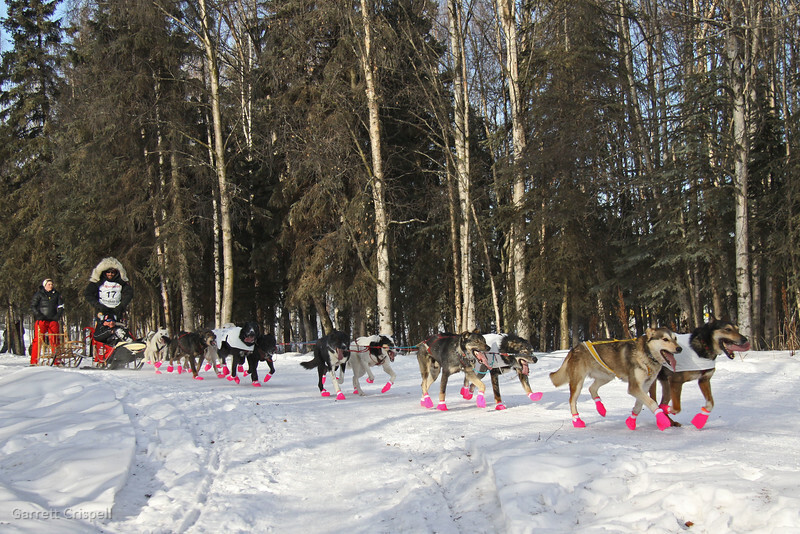 Number 17 (Lance Mackey) to date, is a 4-time winner of the Iditarod and Yukon Quest. You gotta like the booties, they provide protection for the dogs and make a fashion statement. Personally, I think the booties "make the shot." 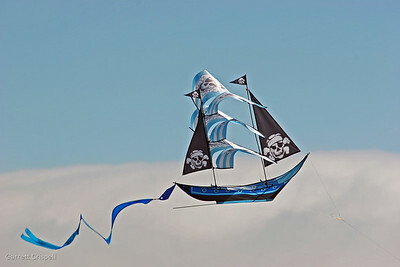 A couple boys were flying their kites along the beach. 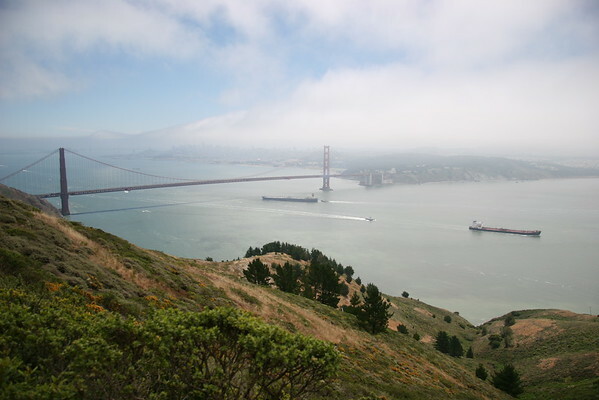 The fog bank was off shore, providing a nice background for a whimsical image. I was visiting my parents in El Granada, near Half Moon Bay, California. 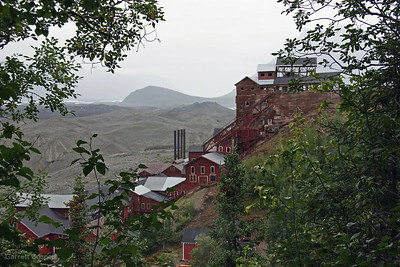 Kennecott Copper Mine is located near McCarthy and was operational for a couple decades. A significant amount of effort was required to establish and maintain its operation. 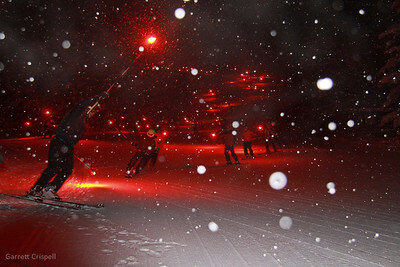 Torchlight Parade Weather permitting, New Years at Alyeska Resort includes a torchlight parade of a few hundred skiers snaking their way down the mountain. 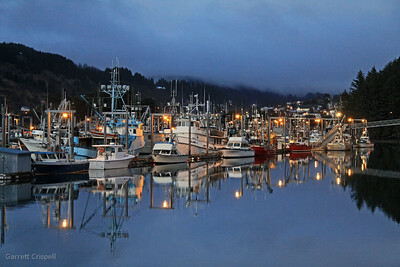 Kodiak Reflection An early December evening provides a reflective moment in St. Herman harbor. A day at the beach, what can ya say? South end of Laguna Beach provided this pleasant locale. 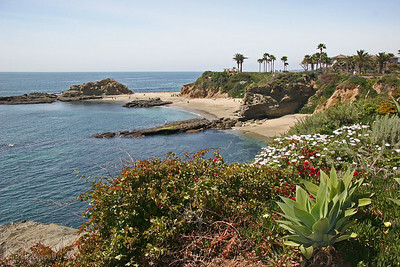 I lived across the street from this place; Montage Resort, in Laguna Beach, California. Invariably, if I didn't take my camera to the beach, I would miss a pretty good photo op. 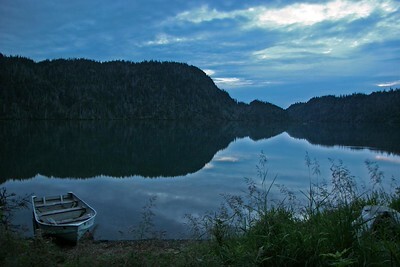 Sitka is a pretty destination any time of the year. There are year round activities to draw visitors year round. 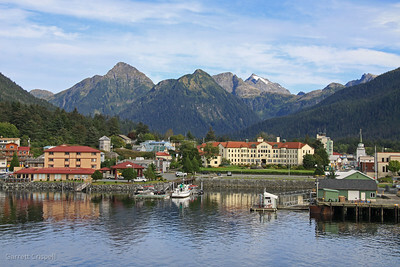 At one point, Sitka was larger than San Francisco, California. 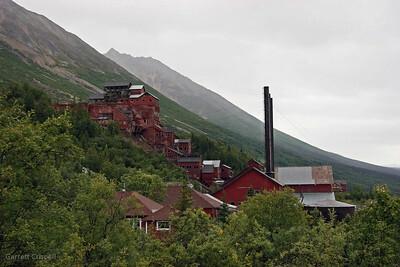 Kennecott Copper Mine, near McCarthy, Alaska. A bustling mine from the early 1900's into the 1930's. Well worth the effort to visit. 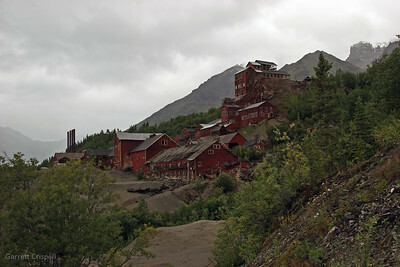 A once bustling silver mine now enduring the ravages of time at Hatcher Pass, Palmer, Alaska. 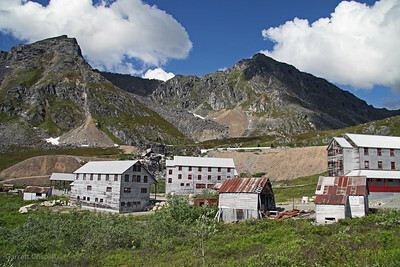 Hatcher Pass is a popular destination for varied summer and winter activities, located about an hour from Anchorage. 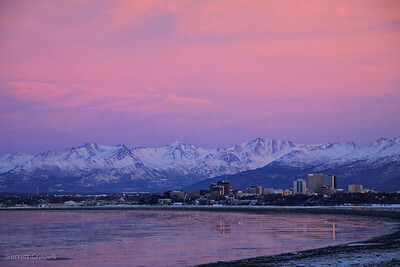 Mid-December sunlight in Anchorage averages five to six hours a day. 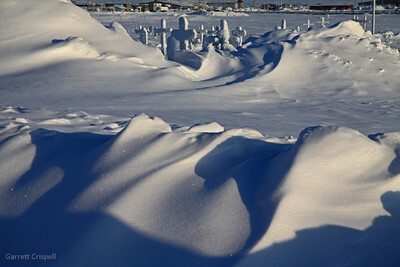 This image is from Earthquake Park looking east - northeast toward downtown Anchorage.